All roads on Crete eventually lead back to Iraklion, so here I am again. Spent yesterday in transit and organizing my photos and notes. Today, I saw another important salvage dig and toured the Archaeological Museum. 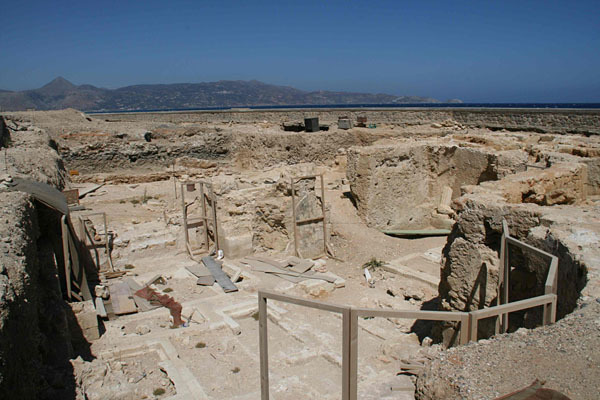 Salvage excavations were conducted last year at this site near the sea, where a pedestrian walkway was planned. Archaeologists found the remains of a Greek Orthodox church built in the 12th century, with intriguing wall paintings that date to the 13th and 14th centuries (the church appears to have been in use until the 16th century). It also featured 36 rectangular graves in the floor, visible in the foreground. This entry was posted by Eti Bonn-Muller on Wednesday, July 29, 2009. Discussion of this blog entry is now closed. 3 comments for "Voyage to Crete: Iraklion"
I would like to know where this church is located. Also, the image that you say is Dionysos is probably not Dionysos but a personification of the sea at the time of the Last Judgement — This should be on the right; there should be a similar personification showing the earth on the left — sea and earth giving up their dead. See M J. Payne, “The Cassiopeia/Neried Mosaic in Kato Paphos: Images Past and Future” in _Visitors, Imigrants, and Invaders in Cyprus_ ed. by Paul W. Wallace, Institute of Cypriot Studies, SUNY Albany, 1995. pp.51-60, which discusses a 14th c. image in Cyprus. Nevertheless, the images of Sea and Earth in Last Judgment scenes can also be found in churches of Greece and elsewhere. I think that I was priviledged to be given an impromtu tour of this site in November 2008! I was finishing my arch. degree in Greece and was walking by this site and noticed what was occuring behind the fence. The director saw me and he invited me in and explained what they had found thus far, showed me the wonderful frescos and let me crawl under the gallery they were excavating at the time. it was the highlight of my time in Crete! Thank you for showing these pictures as I was hesitant to ask if I could take some myself.